People who have a lot of clutter often delay decluttering simply because they don’t know how or where to begin. It’s a task many put off or avoid altogether because they don’t want to make difficult decisions about belongings that have been a part of their life for decades. A great approach is to try thinking of decluttering as something that doesn’t have to be drudgery – it’s even possible to turn it into something fun, an activity in which the whole family can take part. Best of all, if everyone pitches in, you can get it done without the guidance of a decluttering “expert.” Here are a few ideas to help lighten the load. Designate a part of the house for each person to declutter, set a timer for 15 or 20 minutes and let the fun begin. See who can make the most progress within that time period, making clear the objective is to distinguish between items that can be recycled or donated and those that can be thrown away. You don’t want the everyone to simply pile up objects that will be tossed into the nearest trash can – an easy fix but hardly an environmentally responsible act. Once an area’s been decluttered, move on to the next one and let the timer start again. If necessary, make it a weekly occurrence until the whole house is decluttered and well-organized. Separate like items. 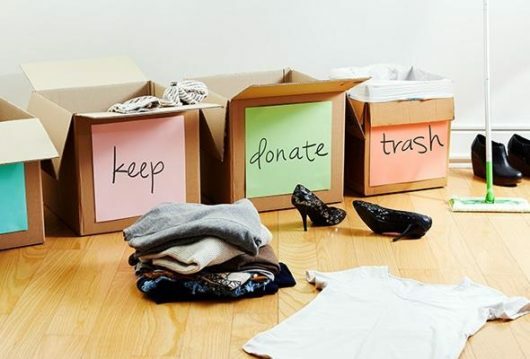 One hurdle to effective decluttering is the difficulty of differentiating like items; that means going through old clothing and determining what to do with each article based on whether it’s to be donated, disposed of or taken to a consignment shop where it can earn you a few dollars. Do the same with shoes, jackets, coats and boots; anything that you might be tempted to lump into one easy category. Have you ever looked around your closet and wondered, “Do I wear that shirt anymore?” or, “When was the last time those pants fit me?” If so, you know your closet is ripe for decluttering. If you want to make sure your doing it effectively, turn the hangers of any items you wear backward over the course of a week. Hangers that remain unmoved contain clothing that can probably be decluttered. You’ll be amazed at how much more free space you’ll have in your closet. Sometimes you need an out-of-the-box view of your home to get a better understanding of what needs to be decluttered. Consider rearranging the furniture: You may find that some pieces actually contribute to the clutter in your home and that some can, and should, be disposed of whether that means donation, placing them into storage for now, or left outside with the trash. Your bathroom is another area that likely needs attention. But it’s not anyone’s favorite task. Organizing eventually leads to cleaning, and cleaning the bathroom means getting down and dirty around the toilet, scrubbing the grout, and getting clumps of hair out of the drains. Start with the easy job first, such as getting rid of duplicate items in the medicine chest and bathroom closet, tossing anything past its expiration date. Once you get your home organized and thoroughly cleaned, consider upgrading your vacuum so that you can tackle every part of the house in a cinch. A versatile vacuum cleaner that’s effective at cleaning the whole house, from tile floors to carpeting to laminate — complete with attachments that allow you to reach behind and under objects — can be a boon. Opt for a model with a HEPA filter, which will eliminate the majority of allergens and other pollutants. Clearing out all the clutter that’s built up over a period of years is always a daunting prospect. But it’s a necessary task if you’re to maintain an orderly and stress-free living environment. There’s no rule that says decluttering has to be a miserable, burdensome job. Try interjecting a little humor and competitiveness to make it just a little more bearable.